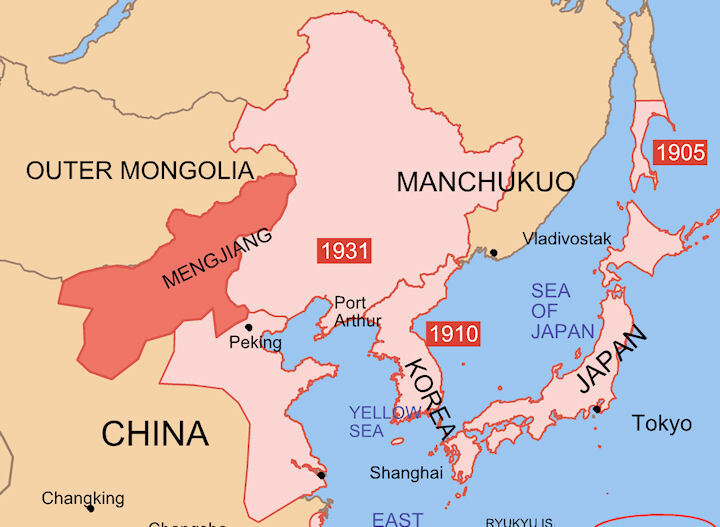 Mengjiang (pinyin: Mengjiang; Wade–Giles: Meng-chiang; Postal map spelling: Mengkiang), also known in English as the Mongol Border Land, is occasionally called Mengguguó or Mengkukuo (in analogy to Manchukuo, another Japanese puppet state in Manchuria). Mengkukuo / Mengjiang was an autonomous area in Chinese Inner Mongolia. Under nominal independent sovereignty, it was actually a puppet state under Japanese control. It consisted of the then-Chinese provinces of Chahar and Suiyuan, corresponding to the central part of modern Inner Mongolia. On January 1, 1912, the provisional government of the Republic of China took office in Nanjing, with Sun Yat-sen as provisional president. The new republic essentially inherited the territory of the Qing court, becoming a multiethnic republic incorporating Tibet and Mongolia and espousing the principle of “Five Races Together in Harmony”. With the end of the Qing Dynasty and the establishment of the Republic of China in 1911, revolutionary ferment also emerged in Mongolia. During this time, Russia started to adopt a more active policy toward Mongolia, to the extent that Outer Mongolia declared itself independent. As early as July 1911, participants in an anti-Chinese meeting in Yihe Huree had petitioned the Russian government -- which long had sought the independence of Outer Mongolia--for help against China. On December 1, 1911, Outer Mongolia in effect proclaimed its independence on the basis that its allegiance had been to the Manchus, not to China. By negotiating with Russia, Japan extended the boundaries of its areas of control as set down in its two agreements with Russia until they reached far as Inner Mongolia. As a result, Inner Mongolia was split into two regions of control, with Japan dominant in the east and Russia in the west. This resulted in a recognition that the eastern parts of Inner Mongolia would henceforth form a part of the Japanese sphere of control. The Manchuria Question had become the Manchuria and Mongolia Question. Around the middle of 1935, the Guandong Army tried to take advantage of an incident in Zhangbei to further its strategies for defense of the Manchukuo border and the establishment of autonomous government in Inner Mongolia. The Menjinag Japanese client state was founded by Prince De (Demchugdongorb) after fleeing a Soviet purge in Outer Mongolia. De Wang [Prince Demchugdongrub] a prince of the Mongolian royal family, had campaigned in Chahar for Inner Mongolian autonomy. In September of 1933 Prince Demchugdongrub presided over a gathering of Mongol princes from Chahar and Suiyuan provinces to found a movement to press for their pan-Mongol state. The Nationalist government in Nanjing, under pressure from Mongolians demanding autonomy, had established the Mongolian Regional Autonomous Political Council, but De Wang was not satisfied. Prince Demchugdongrub approached the Guandong Army, which had used the Doihara-Qin Agreement to drive the Chinese army out of Chahar. In April 1936, the Mongolian Military Government was set up in Dehua in Chahar, under the Guandong Army’s leadership, with De Wang as the head of government, and it quickly concluded a treaty of mutual assistance with Manchukuo. In September 1936 the Inner Mongolian Army pushed into northern Suiyuan Province, backed by the Guandong Army, and clashed with Chinese forces, an event known as the Suiyuan Incident. Following his defeat in Suiyuan, De Wang was forced to rebuild his army. With Japanese help by the time war broke out in July 1937 his army consisted of 20,000 men in eight Cavalry Divisions. These participated in Operation Chahar and the Battle of Taiyuan when the Japanese and Mongol forces finally captured most of Suiyuan province. The Mengjiang National Army was the Japanese created "native army" organized in Mengjiang; not to be confused with the Mongol Army. It was a Kwantung Army special force group under direct command, having Mongolian commanders alongside Japanese commanding officers, as in other auxiliary outer sections of the Kwantung Army. The purpose of the army was to support any eventual Japanese operations against Outer Mongolia (Mongolian People's Republic), or the north China areas, and to act as a local security force, with the local police forces. It also had the duty of protecting Prince De Wang, the head of state, the Mengjiang establishment and local government properties. When the State Mengjiang was founded by the Japanese, it was at first a principality. In 1937, the name was changed to the Mongolian Union Autonomous Government. At that time the South Chahar Autonomous Government and North Shanhsi Autonomous Government were also established in Inner Mongolia, supported by the Mengchiang National Army Headquarters of the Mengchiang Liaison of Ministry of Asian Development Agency of Japan. When the mostly Chinese regions of South Chahar and North Shanxi were added it became the Mengjiang United Autonomous Government on 01 September 1939. In 1941, Inner Mongolia became a semi-independent country, the Mongolian Autonomous Federation. The capital was Kalgan, and the ruler was Demchugdongrub. The new state was officially allied with the Empire of Manchukuo (De Wang was a cousin of the last Manchu Emperor) and sponsored by Japan. Most Mongolian rulers since the 13th century were descendants of Genghis Khan, or claimed to trace their lineage to him. During the period of its Japanese occupation the Mongolian Royal Family was the family of Prince Demchugdongrub (Chinese De Wang), the Japanese puppet ruler of Mengjiang. Prince De Wang, aka Prince Teh, aka Prince Demchugdongrub was a Chahar prince of the Plain White Banner in Inner Mongolia. He and his cavalry forces participated in a number of operations during the war. Mostly known for his cooperation with the Japanese to create the monarchial state of Mengjiang Autonomous Military government, he was an advocate of pan-Mongol nationalism. 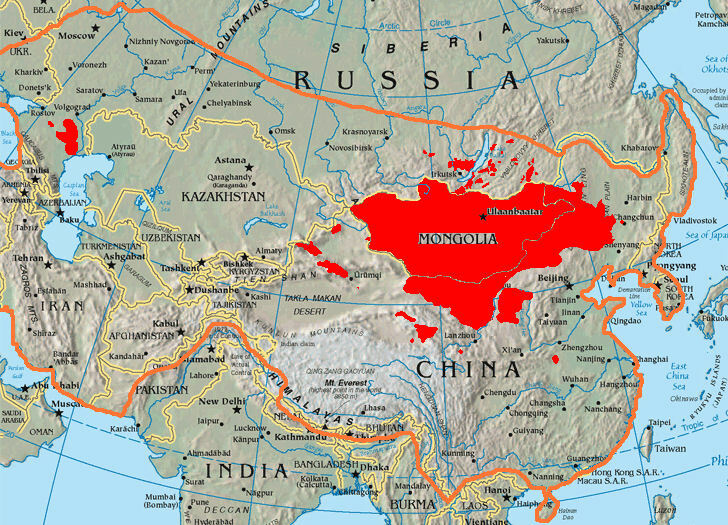 The goal was to revive the spirit of Genghis Khan and create a pan-Mongol empire that would take in Inner Mongolia, Outer Mongolia and other Mongol occupied areas. Greater Mongolia, as a geographical region, is the contiguous territory inhabited primarily by ethnic Mongols. It approximately includes the modern state of Mongolia, the Inner Mongolia Autonomous Region in the People's Republic of China (PRC), and the Buryat Republic as well as a few smaller territories in Russia. The Mongolian People's Republic -- comprised only about half of the vast Inner Asian region known throughout history as Mongolia. 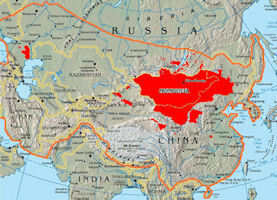 Furthermore, it was only a fraction of the great Mongol Empire of the thirteenth and fourteenth centuries that stretched from Korea to Hungary and encompassed nearly all of Asia except the Indian subcontinent and parts of Southeast Asia - the largest contiguous land empire in the history of the world. "Inner Mongolia" (Southern Mongolia) became directly subjected under the Chinese administrative systemin the 18th century. Outer Mongolia (northern Mongolia, Mongolia current state) remained loosely under Chinese sovereignty until the early 20th Century, when it gained indepedence under Soviet sponsorship. The cause of Mongol nationalism was undercut somewhat by the fact that 80% of the population of the new state was Han Chinese, a byproduct of the fact that this was as far as the territorial boundaries could be stretched given the area Japan controlled at the time. One direct cause of the Pacific War was the breakdown of negotiations between Japan and the US. However, “the uniqueness of Mengjiang region” and the problem of securing “the right to station troops” were also factors which contributed to the war. The Japanese army insisted on securing the continuation of stationing troops in the Mengjiang region, and in the last negotiations demanded an interval of 25 years for stationing the troops. For the Inner Mongolian autonomy movement, the 25 year period was linked to the Mongolian banners region’s autonomy and its reconstruction, but it led to war. Yoichi Shimatsu writes that "Thousands of Japanese Zen “warrior monks,” along with their co-believers from the Nichiren and Pure Land sects, volunteered as combat troops to liberate Manchuria, Mongolia and ultimately Tibet.... 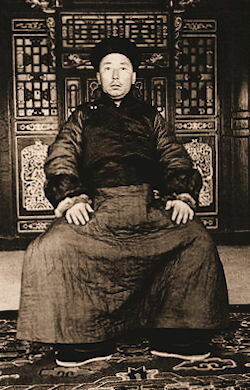 The mastermind behind the “chibetto kØsaku” (Tibet movement) was Goshima TokushirØ, chief of the Buddhism bureau of Mongkuo, or Mengjiang, now Inner Mongolia. The royal Mongol bloodlines were intertwined with the family of the last emperor, Pu Yi, then ensconced in the adjoining “puppet state” of Manchukuo. Both royal houses patronized Tibetan Buddhism. The Kwantung Army sponsored Prince De, and he reciprocated by allowing Goshima to set up a military-intelligence compound in Ulanhot in eastern Mengjiang. From there, the crafty spymaster extended diplomatic feelers aimed at a secret alliance with the Dalai Lama. Tokyo’s secret diplomacy relied on court intrigues and clandestine liaisons between outlandish adventurers, antiquated aristocrats and lecherous lamas. It was either a pantheon of heroes or a rogue’s gallery, depending on how one looks through the kaleidoscope." When Wang Jingwei broke with Chiang Kai-shek and formed his own Republic of China allied to Japan, the Mengjiang state came under nominal Chinese jurisdiction. After 1943, Japan had no choice but to change its China policies because its military had proved inferior. This led to the conclusion of the August 1943 “Treaty of Alliance between Japan and China” which was established between the Japanese government and Wang Zhaoming’s puppet regime. The articles which were related to “the uniqueness of the Mengjiang region” and “the right to station troops in the Mengjiang region” which were part of the “Treaty Concerning Basic Relations between Japan and China” were eliminated. The Mongolian banners region’s advanced autonomy was removed as well, and Wang Zhaoming’s administration’s emphasis on “restoration of sovereignty” and “respect for territorial integrity” took its place. Once again, Wang Zhaoming’s contentions were reflected in Japan’s policies towards Inner Mongolia. In November 1943, representatives of the “independent states” Japan had established in its occupied territories throughout Asia met in Tokyo for the Greater East Asia Conference. In attendance were representatives of Manchukuo, the Wang Jingwei government in Nanjing, Burma, the Philippines, and Thailand, as well as representatives of the Provisional Government of Free India,” who were present as an observer. Japan tried to demonstrate a new Japanese approach to the structure of power in postwar Asia that differed from the thinking behind the Greater East Asian Coprosperity Sphere. Japan surrendered in 1945 and Manchu-kuo and the Mongolian Autonomous Federation consequently collapsed. After World War II, Demchugdongrub lived in Beijing for four years under the supervision of the Kuomintang government. In August 1949, just before the Communist Party of China took control the whole country, he proclaimed an Autonomous Government in the western most region of Inner Mongolia. In December 1949, pushed by the communist army, Demchugdongrub fled to Mongolia and was at first welcomed. But he was arrested by the People's Republic of Mongolia in February 1946 and deported to China in September1946. Charged with treason by the People's Republic of China, , he wrote nine memoirs under supervision and was eventually pardoned 13 years later. At the age of 64 he was released and worked in a museum in Inner Mongolia until his death in 1966.